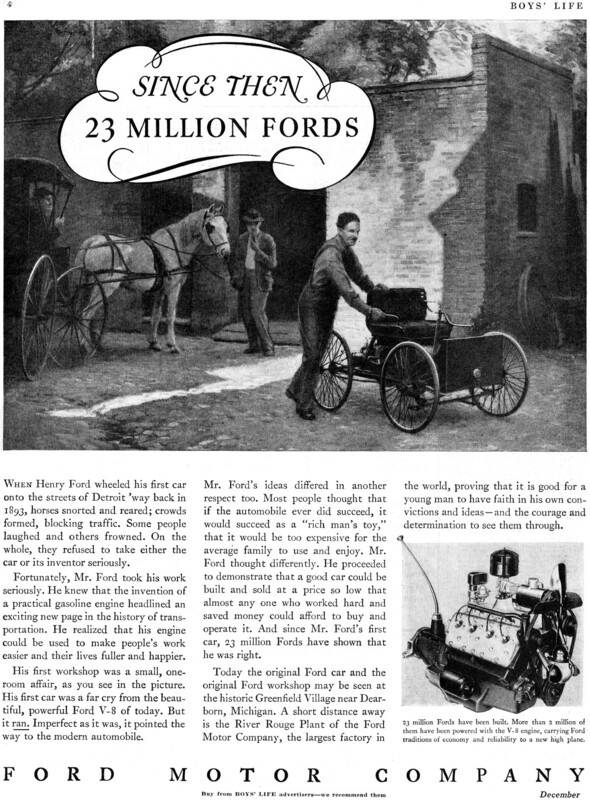 By the end of 1935, according to this full-page advertisement in Boys' Life magazine, Henry Ford's automobile company had built 23 million cars and trucks. Ford Motor Company was founded in 1903 - 32 years earlier- so the average production rate was a little over 4½ million per year. 2 million of them were powered by the V8 flathead engine, which had just been introduced in 1932. As with radios, flying machines, electric lights, and indoor plumbing, every new innovation was considered to be a wonder of mankind's ability to create. 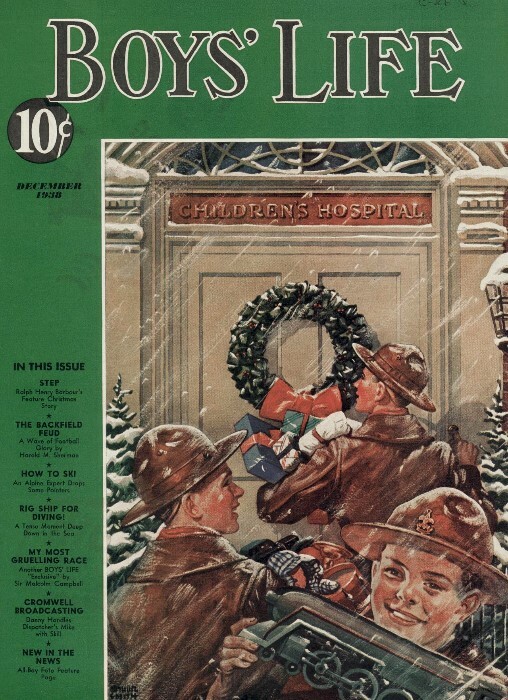 I try to imagine myself seeing these advertisements in magazines back in the days when they were published, reacting the way I do today when some whiz-bang, newfangled technology or product is announced. When Henry Ford wheeled his first car onto the streets of Detroit way back in 1893, horses snorted and reared; crowds formed, blocking traffic. Some people laughed and others frowned. On the whole, they refused to take either the car or its inventor seriously. Fortunately, Mr. Ford took his work seriously. He knew that the invention of a practical gasoline engine headlined an exciting new page in the history of transportation. He realized that his engine could be used to make people's work easier and their lives fuller and happier. His first workshop was a small, one-room affair, as you see in the picture. His first car was a far cry from the beautiful, powerful Ford V-8 of today. But it ran. Imperfect as it was, it pointed the way to the modern automobile. Mr. Ford's ideas differed in another respect too. Most people thought that if the automobile ever did succeed, it would succeed as a "rich man's toy," that it would be too expensive for the average family to use and enjoy. Mr. Ford thought differently. He proceeded to demonstrate that a good car could be built and sold at a price so low that almost anyone who worked hard and saved money could afford to buy and operate it. And since Mr. Ford's first car, 23 million Fords have shown that he was right. Today the original Ford car and the original Ford workshop may be seen at the historic Greenfield Village near Dearborn, Michigan. A short distance away is the River Rouge Plant of the Ford Motor Company, the largest factory in the world, proving that it is good for a young man to have faith in his own convictions and ideas - and the courage and determination to see them through. 23 million Fords have been built. More than 2 million of them have been powered with the V-8 engine, carrying Ford traditions of economy and reliability to a new high plane.